It has been almost three years since the announcement, that the bird safari at Nalsarovar can be booked online on Nalsarovar website. However, there is no news of the same after that. Everyone was happy when the news came out that this tourist season. Visitors to Nal Sarovar will be able to book their tickets to the sanctuary. And even boat-ride from the comfort of their homes, but all in vain. Nal Sarovar is a Bird Sanctuary, Spread over 120.82-sq-km Lake and marshes with shallow waters (4-5 ft). Situated about 60 km from Ahmedabad near Sanand Village. Mainly inhabited by migratory birds as their wintering ground. 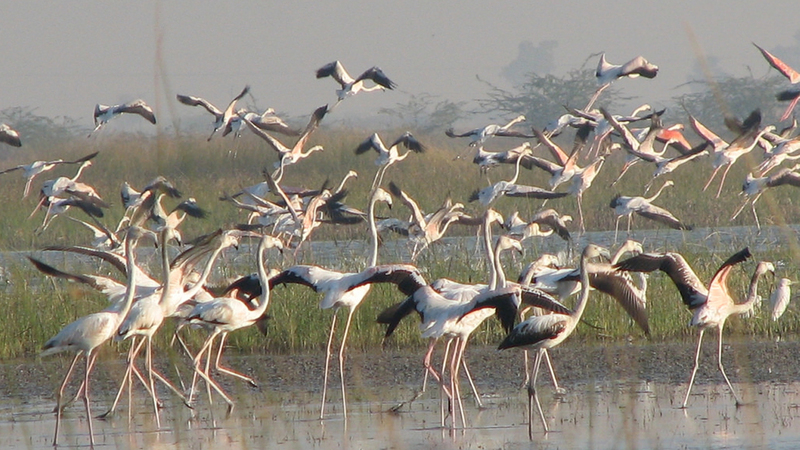 It is the largest wetland bird sanctuary in Gujarat, and one of the largest in India. It is a bird sanctuary since April 1969 and a Ramsar site since 24 September 2012. More than 200 types of birds mainly waterfowl inhabit this lake and come from as far as Siberia. The online booking facility was likely to be operational from 2013 September-October. This was one of the facilities offered as 10-point initiative proposed for the sanctuary to make it more tourist- friendly. The step announced after complaints about boatmen overcharging tourists & heckling them in a bid to get them on their boat. Online booking largely would have eliminated the risk of tourists getting cheated by boat operators. The rates would have been fixed and clearly stated so there would be no question of tourists being cheated. If this facility were live, one would be able to book a ticket for the sanctuary. A boat-ride and a guide too, before even beginning the journey. They even planned that tourists can bring a print out of the booking and pay at the counter itself. It was supposed to be working on the same as one operational in Sasan Gir. The Forest department also had plans to grade boatmen based on their education and the quality of service they provide. For example, one grade of boatmen, would only offer exclusive services to big groups like schools. However, nothing else happened after a single guide-training programme. Most of the guides in Nalsarovar are poor but educated and unemployed. Providing them with a job opportunity would have ensured that they do not indulge in poaching activities. We request the government to get ahead of plans and promises and actually do something. Such fake announcements can only garner few newspaper headlines, but not tourists, which matter the most.